It was a mixed week for Chichester City as they lost 2-1 at home to Hassocks before recovering to beat high-flyin Three Bridges. Read Ian Worden’s reports below, and don’t forget to get the Observer every Thursday for all the latest local football. A couple of weeks ago Chi were right in the promotion mix. Then only four points separated the top six teams. But back-to-back losses against Peacehaven & Telscombe and Hassocks have caused Miles Rutherford’s side to lose ground on the chasing pack. The visitors had the first chance of the game when Harry Williams slipped at the back. Ant Ender got a glove on a well-struck shot. Five minutes later City’s leading goalscorer Scott Jones’ drive was smothered low down by Haig Kingston. Ellis Martin, starting in midfield for Dan Hegarty, sent Kaleem Haitham on his way but when Haitham returned the ball to Martin he shot straight at Kingston. On ten minutes a good knock from Jimmy Wild sought out Jones. The ball wouldn’t sit up for the Chi No9 and he skewed his effort wide. Haitham tried his luck from long distance before Ryan Peake, in for suspended captain Jack Lee, got something on a corner. His header was gathered easily enough by Kingston. A mistake by Ben Pashley let Michael Death in only for Ender to turn his attempt round for a corner. This was cleared to Spencer Slaughter, who rifled a long-range shot wide. Opportunities went begging for Jones and Wild after good work from Lorenzo Dolcetti before the Italian had a go himself after drifting past a couple of defenders. A free-kick from Martin then picked out an unmarked Jones but he couldn’t get the right purchase on his header. At the other end Death went on a jinking run and found George Galbraith-Gibbons, who headed over. Chances came and went for the home side before the break. Sam Ndlovu had an effort turned away for a corner, then Peake threatened with another header before Martin tested Kingston with a fierce strike. 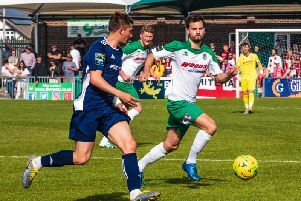 Jones and Haitham spurned opportunities straight after the break before Hassocks opened up the City defence with the best chance of the game so far only for Death to blaze over after getting in one-on-one with Ender. A minute later and only a last ditch goal line clearance prevented the visitors from going ahead. The breakthrough came in the 53rd minute – a crisp finish into the bottom corner by Death. Chi almost equalised five minutes later after a nice exchange between Dolcetti and Haitham set Martin up but he pulled his effort wide. Just after the hour Wild found himself in space again, caught hold of the ball on the half volley but lifted it over the bar. It might have been 2-0 after 63 minutes but Jake Lindsay hit his shot into the side-netting after a one-two. Sixty seconds later Jones went close again with another header. Rutherford brought Scott Murfin and Rob Hutchings on for Ruben French and Ndlovu but before the home side could settle into their new shape Hassocks doubled their lead through Galbraith-Gibbons after a quick breakaway. Hutchings almost pulled one back for City with a thunderous shot that flew over. Play was stopped for ten minutes when Kingston collided with Jones on the edge of the box and had to be stretchered off. The home side pressed and a Haitham cross just eluded Murfin and Wild. With 15 minutes to go, Jones appeared to get the last touch on a Murfin cross to get Chi back in things. Williams and Jones had chances late on but Hassocks held on for an important win that lifts them away from the clubs at the bottom end of the table. Chichester: Ender, Williams, French, Pashley, Peake, Martin, Haitham, Ndlovu, Jones, Wild, Dolcetti (Subs: Lis, Hutchings, Murfin). First-half strikes from Scott Jones and Rob Hutchings (2) helped Chichester put recent troubles to one side with an impressive win against title chasers Three Bridges. This was a team transformed, in many ways. After a lacklustre showing at the weekend in the defeat at Oaklands Park to Hassocks, Chi played with the verve and vigour that characterised earlier performances in the season. Jones had the first real chance of the game after five minutes but was unable to keep his shot down. Then Ellis Martin gave Three Bridges keeper Kieron Thorp something to think about with a nicely struck free-kick. Hutchings stunned the visitors on 10 minutes after a slick move. Jones played a super pass into the path of Kaleem Haitham who squared the ball to Hutchings and the City forward slotted it away calmly into the bottom left hand corner. Chichester doubled their lead on 17 minutes when Jones burst into the box and found the back of the net with a cultured finish. And then five minutes later Hutchings got his second after the ball bounced kindly for him over the head of Nathan Koo-Boothe. The shellshocked visitors pressed and might have pulled one back but for a determined header from Martin under his own crossbar. Chi keeper Ant Ender, who was rarely troubled in this opening spell, claimed a cross comfortably on 25 minutes and then at the other end Hutchings had a fierce shot deflected for a corner that came to nothing. On the half hour mark Haitham went on another raid down the wing, played the ball back to Kieran Hartley who picked out Jones only for his header to dart past the post. Haitham was scythed down on the edge of the box. Hutchings, on a hat-trick, elected to take the free-kick but fired it into the wall. There was a flash-point after 36 minutes when Alfie Lis, Dan Hegarty’s replacement in midfield, was taken out and bundled into the dugout. Tempers flared and referee Robert King had a bit of work to do. In time added on only a well-timed tackled from Ben Pashley denied Nathan Crabb in the penalty area. The visitors then went close from two set pieces, Ender punching the ball away on the second occasion. The home side started the second period brightly. Jones got down the left again, only for a defender to cut out his cross. Then Haitham might have lobbed an on-rushing Thorp but the keeper managed to make a block. Crabb next fired wide for the visitors before Jimmy Wild hit one over from an awkward angle. In the 53rd minute Wild went on one of those mazy runs of his and tried to pick out Hutchings but just over-hit the pass. The City back four of Ryan Peake, Ruben French, Pashley and Hartley defended resolutely to keep George Gaskin and Co. at bay. Wild had a half-chance on the hour but after a good first touch the ball slipped away from him in the box and defenders snuffed out the danger. Then Wild headed wide after Haitham beat the offside trap and whipped a cross in. Three Bridges sought to get back into things with substitute Ben Bacon, ably supported by Matt Whitehead, making an impact down the left. Pashley came to the rescue again on 73 minutes hooking the ball off the goal line. Wild picked up a nasty knock and was replaced by Scott Murfin for the last ten minutes and Harry Williams came on for Haitham. With five minutes to go John Lansdale pulled one back from a free-kick on the edge of the box. City held on though to condemn Three Bridges to their first league defeat since December. The win moved Chichester up to fifth, one point behind Horsham YMCA but some distance off the top two spots. Chi travel to Eastbourne United on Saturday (3pm). Chichester – Ender, Hartley, Peake, Pashley, French, Martin, Haitham (Williams), Lis, Jones, Wild (Murfin), Hutchings.